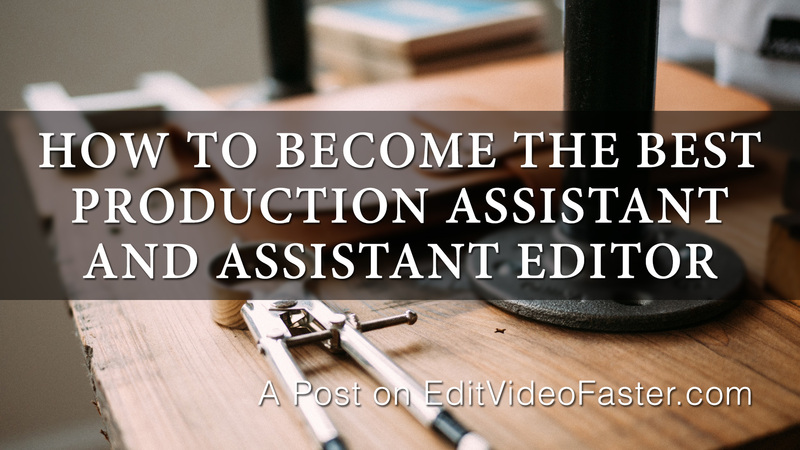 To break into the video industry you almost always have to become a PA, Production Assistant, or an AE, Assistant Editor. I’m assuming since you’re reading this than you’ve either been one, are one or want to become one. I’ve worked as an assistant in a number of industries, as a PA and an AE and through my experiences I learned that there’s only one way to become the best PA or AE. Here it is: Become the best PA or AE by always being one step ahead of the person you are assisting. It’s rather simple. You can stop reading now if you want, my feelings won’t be hurt, or you can continue reading and learn about a couple real life examples from my career. There will also be some tactics along the way that will help you become the best PA or AE. Why would someone want to be the best PA or AE? I don’t know if everyone has this trait but if you’re like me than once you decide to do something then you do it at 110%. You’ll run through a wall if the door won’t open. But if you might not want to break every bone of your body trying to find a Betacam tape in the storage room, let me briefly explain why being the best PA or AE is important. This is how you get jobs. There. I said it. You get jobs through PAing and AEing. You can do them for free, I still work for free sometimes, or you can get paid. You are not going to land a job with a company after college unless you have experience on your resume and/or connections. Both of these are usually made through PAing and AEing. Therefore, be the best at it. This gives you the best shot at any job opening. The summer after my freshman year of college I worked two jobs, neither in the video industry. In the mornings my best friend and I would go to work with my dad at 6:00am building a log cabin then that evening him and I would go “hustle chicken” at the restaurant we worked at. At the beginning of that summer I had no clue what tool to grab, how to use the different saws, the proper way to set up and tear down at the beginning and end of the day, … you get it. My dad was patient with us and showed us how to do everything. **This next sentence is very important if you have PAs or AEs. ** He didn’t do it all at once; he slowly added new tasks each day (if you have PAs or AEs make sure not to overload them and make sure to teach them how to do things, otherwise how are they supposed to know?). After a few weeks we no longer needed much supervision. We set up in the morning and tore down in the afternoon. When my dad needed me to hand him tools I would hand them to him so that his hand could grab the handle properly. PAs – when you hand the camera over, if you’re lucky enough to touch one, make sure that you hand it over in a way that the videographer can grab the handle so he/she is ready to begin shooting as soon as they get the camera. This little extra action might not seem like much but when the next person comes along and hands it to him/her the wrong way, you’ll be remembered. Eventually I’d know what my dad was going to do next so I’d have the tool he’d need nearby. You can do the same thing AEing. If you see that this video is going to require some sort of stock video, go find several examples online and when the time comes hand that information over to the editor. They’ll be thankful they didn’t have to go search for it. A PAing gig with one of my college professors landed me my first professional job. I will write a much more in-depth post eventually but for now here’s the overview. The summer after graduating college one of my post production professors asked me if I’d help him for a few weeks on a video he’s putting together for a local business. He had worked with me one other time before in a group setting. He told me he was asking me back to help him because I excelled above the rest. I knew exactly where he would want to grab the shot and before he could tell me I’d already have the sticks (sticks = tripod) down and ready to go. I spent the next month or so doing the exact same thing. Always being one step ahead of him. I’d be running around warehouses with extension cords and omni lights setting up shots before he knew he needed them. During that summer he told me that I was the best PA he’d ever worked with. Looking back he was probably exaggerating but as a 22-year-old kid that meant a lot. We traveled quite a bit that summer. We ate quite a few meals and had a number of beers together. If you ever get these opportunities as a PA/AE take advantage of them. I don’t think my work in the field was 100% of the reason why he said I was the best PA he’d ever worked with. I think some of it contributed to the fact that I tried to absorb as much knowledge from him as I could. I was hungry to learn and really listened. Use these opportunities if you ever get them. At the end of the summer I got a phone call from him. He lined up a job interview for me for a junior video editor position at a nearby company. My assistant editor is awesome. I wouldn’t trade her for anyone. I wouldn’t trade her for most of the editors I know. And I’m not saying that because I know she’ll read this (and probably correct my grammar). You get the picture. Things like this make you the best PA/AE. Learn and adapt – Example: If someone orders the exact same latte on your first two days then you should have it waiting for them in the morning on the third day before they have to ask for it. Take initiative – Create useful things like my AE did with the stock photo library. Go out for drinks – Socialize with the people you work with. Get to know them and get them to know you. Tell them you’re looking for work – Make sure the people you are PAing or AEing for know that you are looking for work once the project is over. Be selfless – Run through walls if you have to. The returns will never be immediate. The jerk director you pickup lunch for may never call you again. However the field producer might remember you working hard months or years later and give you a call about a new film she’s working on. You never know. You can be the best PA or AE. I learned how by handing my dad the nailgun and setting the sticks before my professor knew he wanted a shot. My AE makes my job easier by taking initiative. Always be one step ahead of the person you are assisting. Go out there and be awesome. Are you currently a PA or AE? What do you do to be the best? Have you been or do you have a PA or AE? What can a PA or AE do to be the best for you? Do me a quick favor. If you enjoyed this post, place share it with something you think could find it useful. I can’t wait to read your thoughts in the comments and I’ll see you on Friday with a new tutorial! 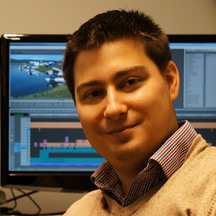 I’m an editor as well as an assistant editor for a cable network. I can’t tell you how important it is, as an AE, to be so adept at your job that the editor doesn’t worry about you. It puts their mind at ease and it leaves a lasting impression. Very well written. Thanks for the article.